UPDATE: I watched the pilot of Mr. Sunshine, and let's just say that out of respect for 10 years of Chandler Bing, I'll give it a couple more episodes to find its voice and hit its stride. As for the pilot, the only time I laughed was during the opening title, which lasted all of 10 seconds. The rest was too much, too quick. This may be the fault of a pilot, having to introduce all the characters, their relationships and their idiosyncrasies in 22 minutes. As for Matthew Perry, his role in this episode seemed solely to react. Hopefully, in the coming weeks, they can slow down the pace and bring the funny. If not, it may mean Perry disproves the second shot theory. More to Come. Friends (NBC, 1994-2004) was arguably one of the most successful television series in history, ranking in the Nielson Top Five every season it aired except its first, when it ranked 8th. Since closing the door at Central Perk in 2004, most of the cast have tried other TV shows with mixed success. In a variant on the Seinfeld Curse, it seems that each of them is finding their best success with the second show they try. Of the six primary cast members, two have moved on from television. Jennifer Aniston (Rachel Green) has become a RomCom staple on the big screen and a tabloid regular based on a hit and miss love life. She has been a true Friend, however, guest starring on episodes of Courteney Cox’s two series. David Schwimmer (Ross Geller) has avoided TV and his face has avoided the big screen. His voice, however, makes regular appearances in the Madagascar animated films as Melman the Giraffe. He’s done some directing, including Little Britain USA for HBO, but that’s not TV, it’s HBO. Matt LeBlanc (Joey Tribbiani) had the most noted attempt at a second hit, rolling right into a spin off with the universally panned Joey. I watched the show and thought it was OK, but no one else agreed and it lasted only two seasons. LeBlanc is getting much more critical and popular praise for playing a caricature of himself on Episodes currently airing on Showtime. Episodes is simply hysterical, skewering the fakeness of Hollywood and celebrities through the eyes of a successful British husband and wife writing team. LeBlanc seems to be having fun and is perfectly happy to make light of his past success, as when one of the Brits disparages the use of catch phrases, and he replies, “Tell that to my house in Malibu.” How YOU doin’ ? Lisa Kudrow (Phoebe Buffay) has developed a nice career in a number of independent films. Her first attempt to return to television was an HBO show called, ironically, The Comeback . Critics raved about the show, and the episodes I’ve seen are funny, but it only made it to 13 episodes in 2005. More successful, both critically and with a strong cult following, is Kudrow’s web series Web Therapy. Kudrow plays a psychologist who treats her patients via a live web conference. The show is apparently adlibbed and allows her to bring on a wide variety of guest stars. The episodes generally run about 15 minutes and since 2008, Kudrow has done 48 of them. In addition to her Web show, Kudrow is also the Executive Producer of the reality show Who Do You Think You Are? which traces the family tree of celebrities with sometimes surprising results. It begins its second season this week. The best second-try success has come from Courteney Cox (Monica Geller). Three years after Friends, Cox came back to TV with Dirt (FX), a behind the scenes look at a tabloid magazine. Critics hated it and fans ignored it and a guest appearance by Jennifer Aniston couldn’t save it; Dirt was wiped away after 20 episodes. But Cox struck comedy gold in 2009 as Jules Cobb on Cougar Town (ABC). This nearly was another miss for Cox, but the original concept of a 40 year old woman chasing younger men in a Florida community was quickly ditched in favor of a richer ensemble show that focused on Jules and her family and friends. Despite the name, Cougar Town has blossomed into one of the most reliably funny shows on the air. Read more about it here. And so that leaves the last of our friendly sextet, Matthew Perry (Chandler Bing). Perry made a high-profile return to series television in 2006, costarring with Bradley Whitford, Steven Weber, Amanda Peet, D.L. Hughley and others in Studio 60 on the Sunset Strip . Created by Aaron Sorkin (The West Wing , Sports Night ), Studio 60 was one of two behind-the-scenes of a faux-SNL shows that premiered that season, 30 Rock being the other. Studio 60 may have suffered from the comparison to Tina Fey’s work of genius as well as from uninformed expectations. It was an hour long dramedy with Sorkin’s trademark rapid-fire dialogue, with layered, flawed characters. I for one loved the show and list it among my personal “Gone too soon” favorites. Now Perry is making his second try at reproducing the Friends success story with Mr. Sunshine (ABC) premiering Wednesday, February 9th. Perry plays “Ben Donovan, the self-involved manager of a second-rate San Diego sports arena who begins to re-evaluate his life on his 40th birthday.” It’s called “Mr. Sunshine” because he manages the Sunshine Arena and because he’s a bit of a selfish curmudgeon, get it? The show also stars Allison Janney as his boss, apparently playing against the type she established in her Emmy winning role on The West Wing. Her character has been described as “unpredictable“, “highly erratic”, “shameless” and “politically incorrect and inappropriate.” The show also features Andrea Anders, who has thus far been the Typhoid Mary of sitcoms. Anders is a very funny actress and as cute as could be, but given that her previous shows include Joey, The Class and the superb Better Off Ted , each of which lasted two seasons or less, one wonders if she has some bad Karma following her. The setting of Mr. Sunshine allows for all sorts of acts to come to the Arena, setting up all sorts of things for Perry to react to, and Perry and Janney are both engaging and fun actors, so this show may have a chance. It will be interesting to see if his famous Friends decide to stop by, during sweeps weeks, of course. So tune in to see if the second shot theory holds up for Matthew Perry. In the meantime, I’ll track down Gunther and see what he’s been up to. Mr. Sunshine, premiering Wednesday, Feb. 9 at 9:30/8:30c on ABC. Questions? Comments? Scathing rebuttals? Amusing Anecdotes? "He's an architect named John. That is a top two job and my third favorite name. And, come on, what are the chances that I am going to meet a point guard named Adam?" What’s That Grimy Sheen on Your TV? Wm. 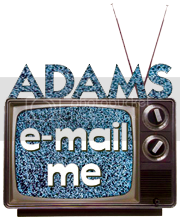 Adams is an average TV viewer with a lot of opinions. He is wage slave and a family man, and a lifelong fan of the medium. Wm. Adams watches too much TV via DirecTV. Thinking of switching? Drop me a line, I'll give you my account number, and we'll both save $100. Travel theme. Theme images by subjug. Powered by Blogger.